Saxophone Colossus overlooked (and that’s a tall order!) The mystery of RVG/ Prestige alphabetic stamp codes. Followers of The Evil Silver Disc might want to sit this one out. It’s deep vinyl. Jim R has a jazz vinyl collection to die for. 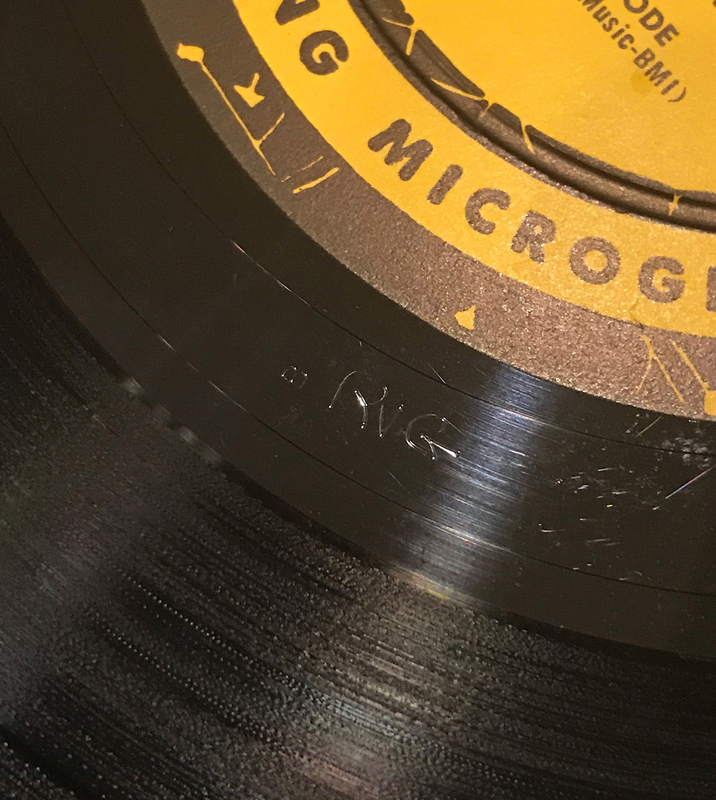 He and stalwart Van-Gelderophile and LJC Forum moderator DGmono have been grappling with something I confess I had completely overlooked: the presence on Prestige records of an alphabetic code next to Van Gelder’s hand etched initials, in this case on copies of Saxophone Colossus. What could they mean? Do they differentiate first pressings in any way? 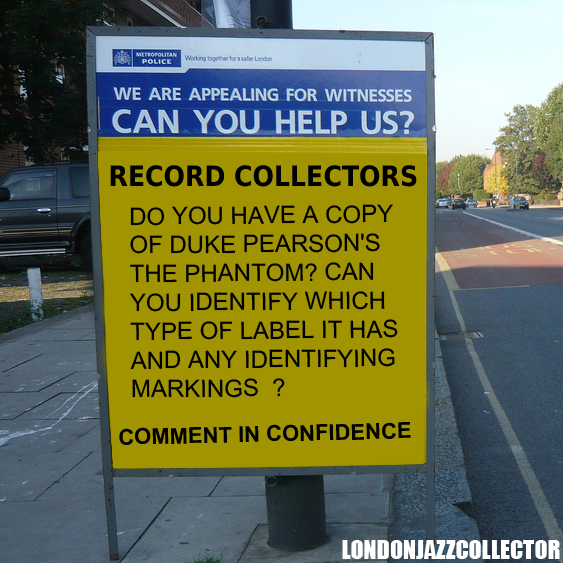 More importantly, to a revered global authority on all things vintage vinyl jazz, why don’t I know the answer to this? “There appears to be at least two versions of the release bearing the same 446 West 50th labels. Version 1 has a true flat edge vinyl with a very small B stamped next to RVG on one side and a very small c stamped into the opposite side. This version came with the green tint jacket. Remember: Jim’s flat edge copy – which corroborating and circumstantial evidence suggests is the earliest – has a B and a C stamp. The copy that appears to be of later manufacture but still within the years of the New York label has an A stamp on both sides. Both pressed by Abbey Mfg. Holy Non-synchronicity! I love it when “logical” assumptions lead you astray. Everyone thought the mighty Columbia worked in an orderly alphabetic sequence with Kind of Blue, as though following the order of the alphabet was part of process control. However when thirty cuttings were made simultaneously, all the same, sent to multiple plants, it didn’t matter who got which letter when. Logic (intelligent guesswork as to how you think things ought to work) is an unreliable friend. Sometimes, possibly often, different from how things actually work. Close up, and I’ll be hornswaggled (again) Not just a C stamp. Dammit the flip side offered up an E stamp. Remember: Jim R has a flat edge original original copy which also has a C stamp on one side but paired with a B stamp. I have E. What gives? 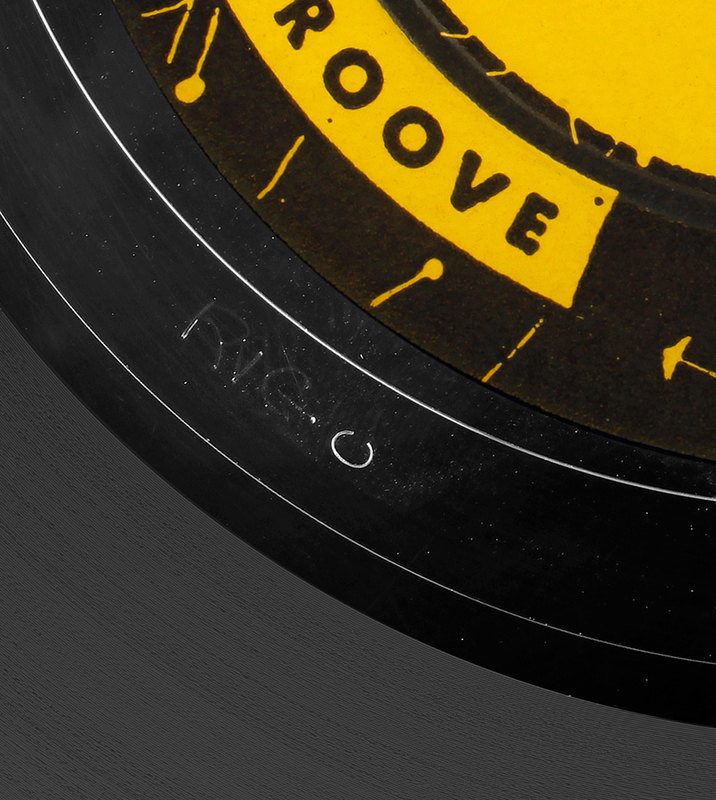 Plastylite ears, 9Ms and other etchings often appear randomly positioned around the central vinyl land, but in every case so far, the alpha code is positioned next to RVG’s signature. Not exactly the same position, some are before the RVG, some after the RVG, but always close enough to suggest by design, not randomness. Rudy was using a coding attached to his name. It’s a Van Gelder managed code: cut on a sequence of intermediate mothers perhaps? Is there a D stamper out there? Does it go beyond E to F or higher? Appeal for witnesses. Collectors: check your Saxophone Colossus copies for alpha stamps. Maybe other Prestige. No time for logic, we need to gather experience, find out what happened. Do you have knowledge that could contribute to solving this mystery? Tell us what you’ve got. If you already know the answer, share it. My thanks to Jim R and DGmono for tirelessly chasing these fascinating vinyl mysteries, and giving me no peace. Who needs peace when there are mysteries to solve? Oh, by the way, it’s a great album. Did I get round to mentioning that? I have seen this symbol several times before, but I keep it in my “Unsolved Mysteries” file, as I have no idea who it is. Whilst Prestige’s preferred pressing plant was Abbey Record Mfg. as indicated by the frequent presence of an AB stamp or etching, this looks like someone else’s work*. When records sold in record numbers, and more copies were needed quickly, other plants with any spare capacity would be brought in, as possibly here? Any owners of the NYC label copy have other indications of pressing plant origins? It might throw up some previously unknown association with the stamper codes. My thanks to Peter dJ for sending this in. 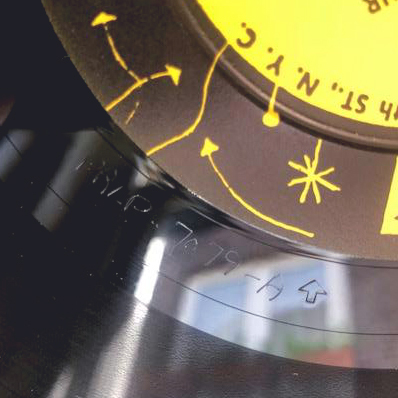 UPDATE III, June 12, 2018 – *Peter dJ tells me the pressing with the “This Way Up” mystery symbol also has an AB stamp, so it is connected with Abbey Record Mfg. in some way. Now I am totally baffled. This entry was posted in Prestige, Sonny Rollins and tagged Alpha Codes, Original Prestige Issues, runout stamps, RVG by LondonJazzCollector. Bookmark the permalink. A, B, C codes spatially separated from the matrix code can be found on EmArCy. I have heard EmArCy MG 26043 as 10 inches “Clifford Brown & Max Roach” in two different variations. Kept the A / A stamped 10″ as it sounded superior. The other copy is not in my possession any longer. It had a D or C stamp. Jim, if so, which edition of your two N.Y. Prestiges sound better? This is the only reason why I bother about these subjects. 7020 Rollins Plus 4. NYC, Raised Edge. Very small embossed “B” on both sides, close to etched “RVG”. 7095 Rollins Plays for Bird. NYC, Flat Edge. Very small embossed “B” on both sides, close to etched “RVG”. Etched “AB” on both sides. When I get a chance, I will check other NYC pressings and report back. Question- when was the last Flat Edge pressing released ? Jim’s list included in the post above indicates his copy of 7094 is a flat edge. My copy of 7095 is a flat edge. Both are c1957. Surely these are near the end, correct ? I have a (PRLP 7079) 466 west 50th, with etched RVG and a stamped B on side 1 (etched AB). Side 2 has stamped A next to the etched RVG and etched AB. I forgot to state it was a flat edge. N.J. copy here with an “A” after RVG on both sides (and some other funky symbols on the A side). Frustratingly, it appears it may be a continuation of another page, but I have not located the other page yet. – Side 2: (small) C left from RVG. 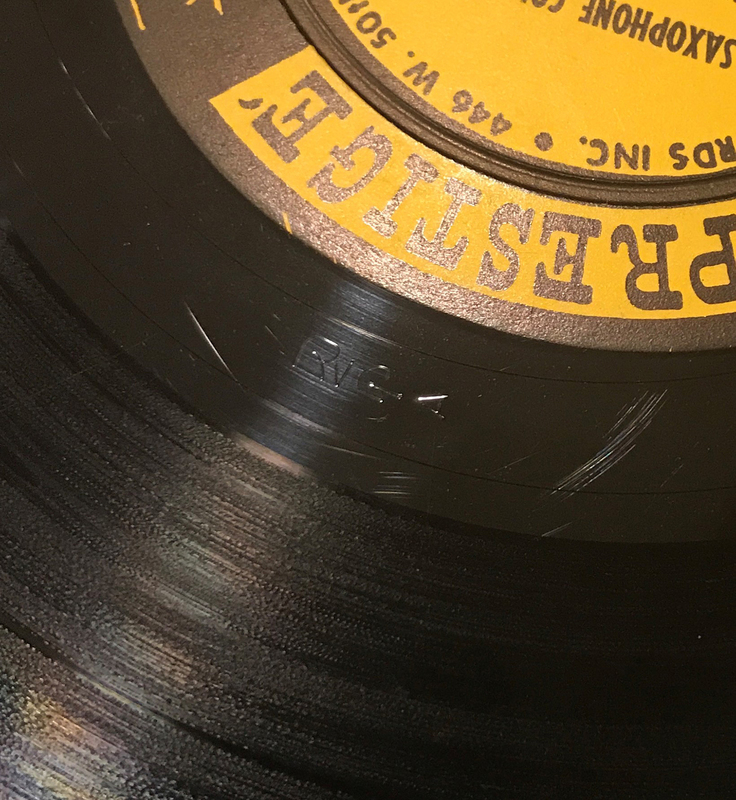 What I never noticed before: side 1 has a sort of upwards directing arrow stamped into the dead wax, directly right from: “PRLP – 7079 – A”. Not sure what that means. I have to my eyes a blue cover with maybe a green tint. Sure looks blue on quick look. True Flad edge and A mark sid 1 and C mark side 2. The Pressing says “AB” which is for Abbey Plant I think. I also have a 50th St NYC copy and mine has an A stamped in BOTH sides, and the cover is deep blue, no tinge of green. Is this a mother pressing? Wishful thinking, who knows ..
7079: RVG and AB both sides, side one C, side two E.
7126: RVG machine etched, AB side two only, B on side one and C on side two BUT preceeded by a cancelled B.
dear LJC, have a nice headache!! Note that the letters (to my knowledge) only appear on Prestige records. Also note that Dott’s NYC copy has C on side 1 and E on side 2. Dott says his also has a “flat edge”, though he says it doesn’t have the sort of “cylindrical” shape of Blue Note flat edges. I will say, I currently have two NYC Prestiges (both of which have A on both sides), and the “raised lip” on them is quite minimal, meaning they almost look like flat edges. 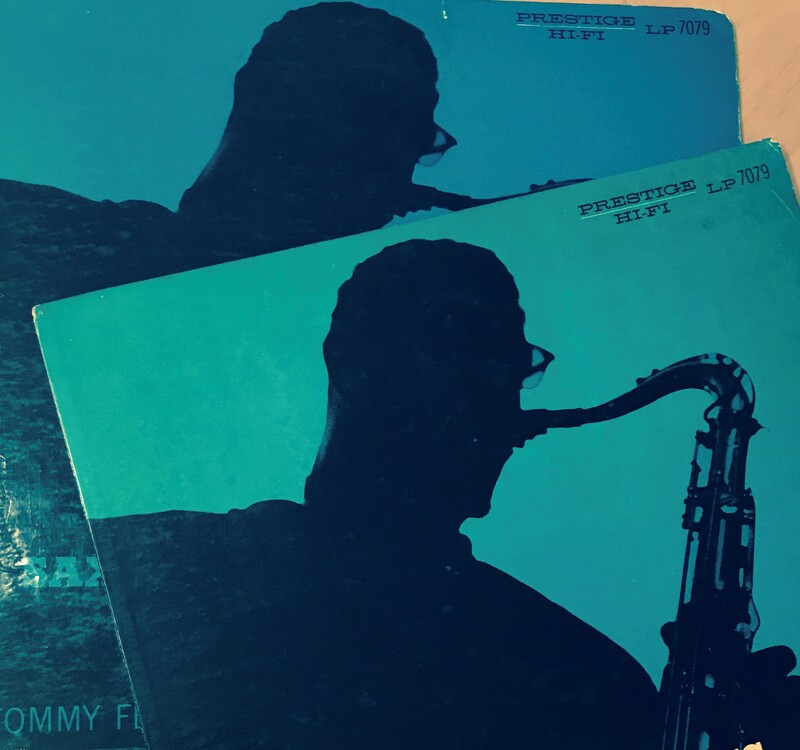 Then again, Jim R has two copies and says that one is flatter than the other, it’s also interesting to think that some NYC copies of Sax Colossus are flat edge and some aren’t. The letters look “embossed”, right? So that would mean they were in all likelihood created at the stamper stage, which would mean Van Gelder did not put them there? My guess is that you will see a lot more “A” copies out there for various titles, and that the letters indicate an order for the way in which the stampers were made. Without the flat edge on Jim’s B/C copy, were would probably conclude without objection that the letters indicate an order for the stampers. 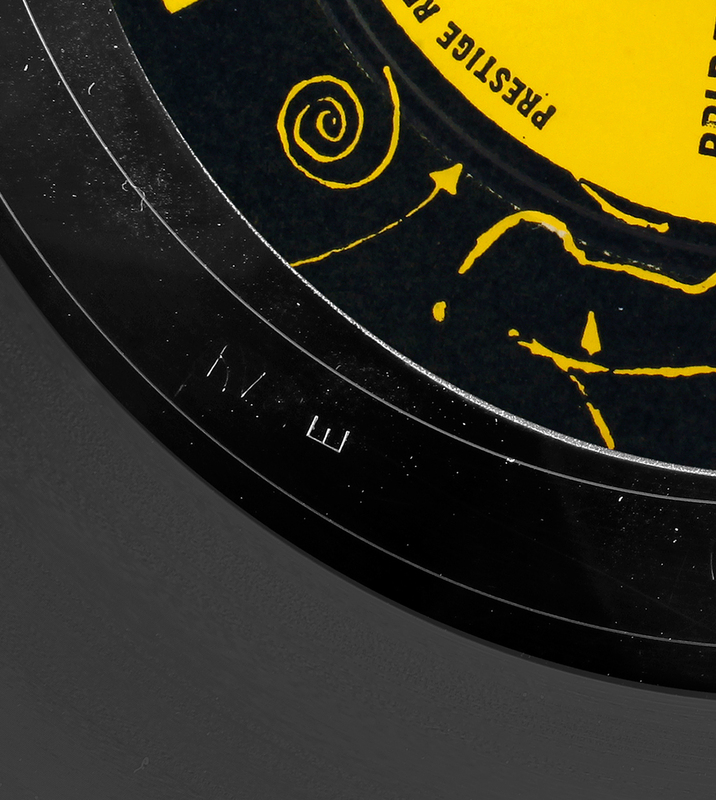 But the flat edge B/C copy makes me wonder if the pressing plant was perhaps using two presses simultaneously to press Sax Colossus, one with flat edge stampers and one without?? And if a letter gets skipped, the stamper may have broken early on in its run or maybe was rejected? Flat edge or not is a result of the electro-plating process. As long as we don’t know which plating plant Prestige has sent the lacquers to, this is a highly irrelevant information. I doubt that we will find out about this fact without browsing the Prestige archives, as there had been more than one hundred plating plants in the NYC vicinity focusing on electro-plating metal parts for the record industry. Given that the above letters really represent the different stampers, this would mean that only between 20.000 and 25.000 copies of Saxophone Colossus have been sold between 1956 and 1964 (about 2.500 copies per year) – if Abbey really pressed 5.000 copies/stamper like EMI’s Hayes plant in the early Sixties (a extraordinarily high number of copies per stamper). And the stamper hypothesis doesn’t answer the question, why most releases, no matter if pressed by Abbey, have no letter at all – you would expect an ‘A’ representing the first stamper on all of these releases. BTW: all stamps embossed in either lacquer, mother or vinyl look embossed, stamped information on metal masters and stampers appear raised. By “embossed” I meant raised. I never knew that metalwork was sometimes (often?) made somewhere other than the pressing plant, interesting! I agree, it’s really difficult to draw a conclusion here. Kevin Gray once said to me that it’s rare for a stamper to press more than 1,000 copies of an album. That being said, my guess is that even the most popular of these jazz albums were pressed in relatively small quantities, though there doesn’t appear to be a lot of information on how many copies of these jazz albums were pressed or sold. The number of 5.000 copies per stamper has been researched by Frank Daniels when talking to employees responsible for the first Beatles pressings at Hayes plant. Decca seems to have limited the number to about 600 copies (according to Frank Wonneberg). Has been shot in 1956, made to fit Saxophone Colossus perfectly. Pressing plants like Plastylite were much too small to afford a plating plant of their own, they didn’t even have a printing department. Miles Davis 7150 promo has RVG A on both sides. Great post. Wish I could add to the Colossus mystery but alas, for me a W 50th St. New York (or a Bergenfield for that matter) copy is but a pipe-dream. 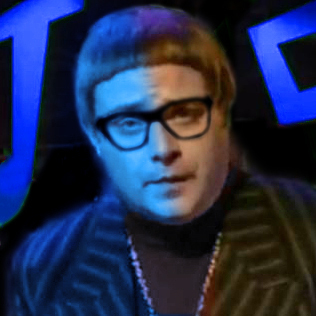 As for the tongue in cheek Phantom appeal, yes, yes and yes I can…thank goodness for “affordable” Blue Notes! Some later OJC (Original Jazz Classics) pressings of Saxophone Colossus (and Tenor Madness) use the old DCC stampers and lack the tacky gold frame on the cover. Unfortunately there is no way to tell from the cover but if you have the record in hand you can see the “LPZ-2008-A-1M STEVE HOFFMAN/KEVIN GRAY” scratched over in the deadwax. If memory serves, these letter stamps are actually not pressed “in” the vinyl but are in relief. It seems likely that they are indeed stamper codes since the various letters, when pressed “in” the stamper, would create a relief when pressing the actual record. The matrix etching is the same on these so they are not different lacquer cuts but the letters were put on at a later stage in the process, like the Plastylite “P” was. quality control? If you start finding a bad batch of records, you can’t go several thousand to find the defective ones. Rather isolate it to a specific run and toss them? FWIW, I think you have it right, Aaron. I have a N.J. Pressing with a “C” on both sides. Stop the world I want to get off …. I’m a bit puzzled – I never came across US pressing plants using stamper codes (like you will find them on Decca or EMI related labels), US record labels usually indicate the tape masters and lacquers as part of the matrices, like in case of the well known Columbia -1A/-1A scheme. The lacquers are sent to the pressing plants and these electro-plated their own metal parts, usually without marking the respective stampers (sometimes, you’ll find faint slashes, ‘V’s or ‘X’s in the run-out which may refer to the respective stamper). But this was only true for the mayor labels, smaller pressing plants like Plastylite or Abbey Manufacturing had no electro-plating department, so Prestige sent their lacquers to an unknown plating company and the metal parts were sent back to Prestige. I would say that most probably the letters refer to Van Gelder’s lacquers, as he certainly had to cut more than one for issues exceeding 50.000 copies and the stampers might have been sent to different pressing plants bearing the same lacquer-letter. Just an educated guess. To my knowledge the Columbia codes are embossed, which would mean that they are not created at the mastering stage that creates the lacquer. Embossed codes must occur at either of the “negative” pressing phases, which would be the first metal master or stamper stages (the mother would be a positive in between them). I’m not an expert on the Columbia codes, but I would guess that the number either represents the metal master or the mother, that the letter represents the stamper, and that the code was added at the stamper stage. And the same with Prestige, that the letters were added to the stampers. The engraved V’s and X’s you are talking about would have been added at one of the positive stages, either the lacquer or mother. What leads you to believe that the metal parts for Prestige titles weren’t made by Abbey? Isn’t that the primary responsibility of the pressing plant? I’ve never heard of the metal parts being made anywhere other than the pressing plant. I’m led to believe that on very rare occasions (“wildly” popular jazz albums — which isn’t saying much in terms of quantity — titles like Somethin Else and Blue Train) Van Gelder would have needed to cut more than one lacquer. I have no idea how many copies a single lacquer could make usually but it would appear that it was a lot, as we occasionally see the same lacquers being used to create copies over a decade after the first pressing of an album. I have a 50th St. NYC copy with the C on side A and the E on side B.